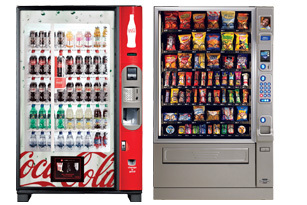 Get your Hartford business started in vending machines or coffee service right now with American Food & Vending! AFV has the experience (30 years in business) and know how to take care of any business, small or large. With a quick phone call, we can come out to your Hartford business and work with you in determining the needs of your business. Your Hartford business has a lot of vending options to choose from. Coca Cola products, Pepsi Cola products, vending machines with generic food and beverages, snack vending machines, candy vending machines, hot or cold food vending machines, coffee vending machines, and of course vending machines with the best in nutritional food and beverage items. We are full service, and will set up, fill up, keep them full and maintain your vending machines. There is no cost to you, except for a little bit of your time and the use of some electricity. With the new technologies and energy conserving machines, that expense is kept at a minimum. You’ll still save money by keeping your employees off the roads of Hartford leaving the office to go and get coffee or snacks. A lot of productive minutes are lost when they have to do that! Pump those employees up with coffee service at your Hartford business! Nothing gets them focused and back on task like a good cup of coffee. Having American Food & Vending take care of the coffee needs can actually save you money! No more sending employees to the store for expensive, mismatched supplies that never seem to keep the masses happy. We’ll take care of all the goodies like coffee, cups, filters, creamers, sweeteners, napkins and stir sticks. Your office will appreciate the difference! They will also appreciate getting those 5 gallon bottles out of the way when you have us install and in-line water filtration system. No more lifting and lugging those suckers around anymore. You’ll have an endless stream of crisp, clear, awesome tasting water!